When you shop at Amazon through AmazonSmile the AmazonSmile Foundation will donate a percentage of your purchases to Learning Stewards! Supporting Learning Stewards by using AmazonSmile won’t ever cost you extra money or add any hassle to your shopping. 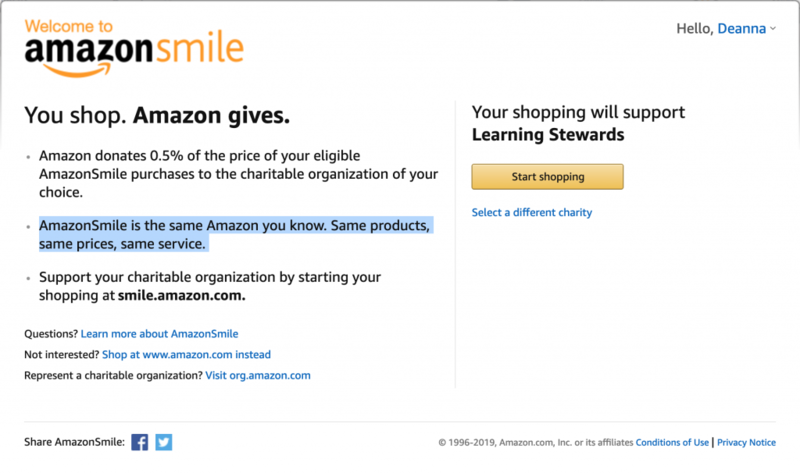 Every time you use smile.amazon.com you will be automatically contributing to Learning Stewards (again at no extra charge to you)! Remember, you must go to smile.amazon.com (use the bookmark), not amazon.com or your smartphone app, to have your purchases contribute to Learning Stewards.